Esther has found her doll, but we still have a mailing list of people looking for this same doll in brunette. 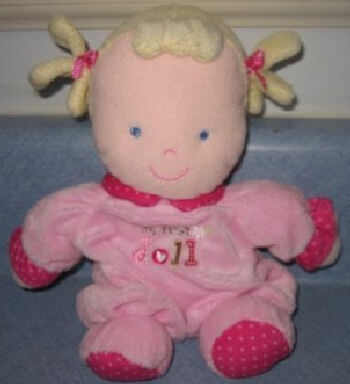 I’m looking for a Carter’s Just One Year blond doll with cloth pigtails, not yarn. She’s wearing a pink sleeper with dark pink and white polka dots collar, cuffs, and bottom of the feet, with My First Doll embroidered on the sleeper. My 2 year old had one and it got lost. She usually does not go to sleep without it. All blond Budget is the hard part some better than others. Thanks, Carrie! I’ve passed the list along to the mailing list. Thanks, Valerie. I passed the link along. Thanks, Judy. I passed it along to the mailing list. Here’s a blond one for the list.